Viren Murthy (Co-editor), Fabian Schäfer (Co-editor), Maz Ward (Co-editor). Confronting Capital and Empire: Rethinking Kyoto School Philosophy. Brill, 2017. Confronting Capital and Empire inquires into the relationship between philosophy, politics and capitalism by rethinking Kyoto School philosophy in relation to history. The Kyoto School was an influential group of Japanese philosophers loosely related to Kyoto Imperial University’s philosophy department, including such diverse thinkers as Nishida Kitarō, Tanabe Hajime, Nakai Masakazu and Tosaka Jun. 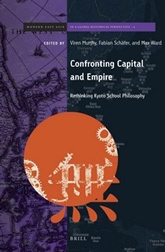 Confronting Capital and Empire presents a new perspective on the Kyoto School by bringing the school into dialogue with Marx and the underlying questions of Marxist theory. The volume brings together essays that analyse Kyoto School thinkers through a Marxian and/or critical theoretical perspective, asking: in what ways did Kyoto School thinkers engage with their historical moment? What were the political possibilities immanent in their thought? And how does Kyoto School philosophy speak to the pressing historical and political questions of our own moment?